My first visit to Nashville was roughly 15 years ago. Like many before me, I was there to pursue a dream—but not to become a country music star. Trust me, no one wants me to sing, including myself. I was there to complete the Country Music Marathon. Covering 26.2 miles of the city on foot meant passing by many of the city’s highlights: a full-scale replica of the Parthenon, Music Row, the honky tonks on Lower Broadway, and hot chicken joints. In my quest to complete the marathon, I had to rush by these attractions, and spicy hot chicken was definitely out of the question. I returned to Nashville recently to slow down and experience all this saucy Southern city has to offer. Here are five of my favorite Nashville experiences from that adventure. Nashville’s Music Row has been ground zero for hopeful musicians for decades. Strolling through the magnolia-lined streets symbols of music are everywhere. Record label offices, recording studios and radio stations dominate the neighborhood. The historic RCA Studio B where music legends like Dolly Parton and Elvis Presley recorded hits is open for tours. At the Music Row roundabout, a bronze piano player pays tribute to songwriter Owen Bradley complete with bronze sheet music for two of his well-known tunes: Crazy and Sweet Dreams. The statue is at the center of a brick circle with the names of Bradley’s songs on display. 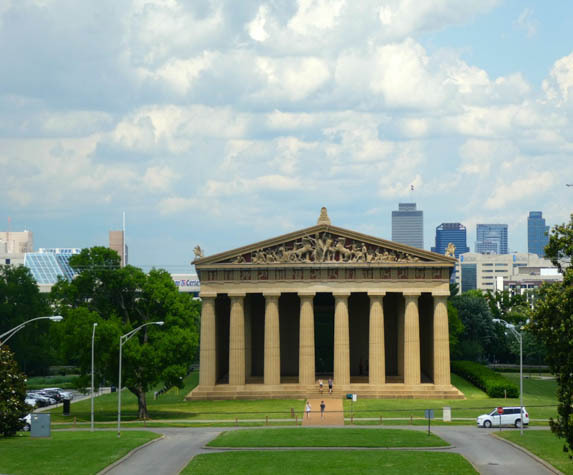 While Music Row clearly focuses on Nashville’s title as Music City, Centennial Park celebrates the city’s other moniker, “Athens of the South.” At the heart of the park’s 132 acres stands a full-scale replica of the Greek Parthenon. Inside, a 42-foot gold-coated statue of the Greek goddess Athena stands amid art exhibitions and plaster recreations of the Parthenon Marbles. The Parthenon replica was built for the 1879 Centennial Exposition, a six-month celebration of Tennessee’s statehood. Outside the Parthenon, the park has an exercise trail, dog park, art activity center, sand volleyball courts and Lake Watauga. It’s an ideal spot for a picnic too. This spicy chicken has an even spicier history. In the 1930’s, handsome Thornton Prince got himself into a little trouble on a Saturday night when he stepped out on his lady. To punish him for his indiscretions, she doused his Sunday fried chicken with cayenne pepper. Although it made the womanizing Prince sweat, he liked his spicy chicken and ultimately opened Price’s Hot Chicken Shack kicking off Nashville’s hot chicken craze. I sampled this spicy chicken at Hattie B’s Hot Chicken where it comes in several degrees of heat: Southern, Mild, Medium, Hot, Damn Hot and Shut the Cluck Up! It’s accompanied by Southern sides like red-skinned potato salad, pimento mac & cheese and Southern style greens. If you’re going for one of the spicier styles, grab some extra napkins and be prepared to sweat. For great photos of the Nashville skyline, take a stroll across the Shelby Street Pedestrian Bridge. The bridge spans the Cumberland River and includes four scenic pedestrian overlooks which have artistic renderings of the history of life on the river in the metal of the railing. When the sun goes down, the bridge dramatically lights up making it a popular spot for a romantic stroll. The Shelby Street Pedestrian Bridge connects nearly 22 miles of walking and biking trails that comprise the Metro Nashville’s Greenway system. On the east side of the bridge downtown, Cumberland Park features sandboxes, spray fountains and a climbing wall to entertain kids of all ages. No visit to Nashville would be complete without a visit to one of the many honky tonks on Lower Broadway. Although there’s plenty of country music pouring out into the street, you’ll also find bluegrass, hillbilly, rockabilly and classic rock. Robert’s Western World mixes things up with Brazilbilly, traditional country with a Latin flair. At Nudie’s Honky Tonk, country music legends are honored in the memorabilia lining the walls. You’ll find suits worn by Johnny Cash, Hank Williams and more all tailored by Nudie Cohn. And don’t miss Tootsie’s Orchid Lounge whose early patrons included Kris Kristofferson, Mel Tillis, Patsy Cline and Willie Nelson. Have you been to Nashville? What was your favorite experience?